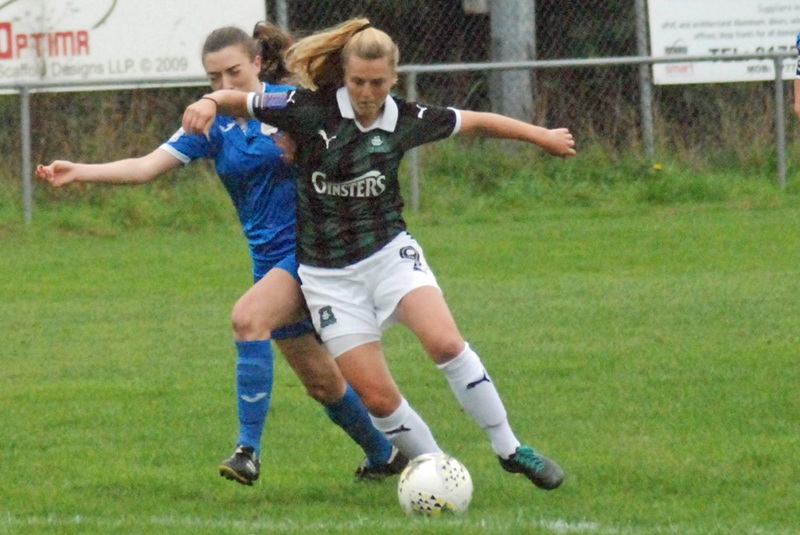 PLYMOUTH Argyle continued their winning run with a 5-3 victory over C&K Basildon in the Women’s National League Premier Southern Division at Haye Road on Sunday. However, Argyle’s players came off the park wondering how they managed to let in three late goals in a game they totally dominated. Up until then Argyle were in total control. They spent most of the match taking pot shots at the Basildon goal and the visitors’ rare attacks easily stop by a solid defence. Argyle took a 17th minute lead when Amber Pollock controlled a cross to set up Helen Bleazard, who fired in a left-foot drive from the edge of the penalty area. Pollock, Zoe Cunningham and Bleazard all went close, with Pollock slamming the ball against a post. Kayley Lame had a goal disallowed before being put through by Beazard to make it 2-0. Basildon rarely troubled the home defence which was well marshalled by captain Katie Middleton. The Pilgrims were relentless early in the second half with the Basildon defence under siege. And it was no surprise when the hosts increased their lead when Pollock fired in. Argyle continued on the attack with Lane feeding Bleazard, who steadied herself before firing in. She then saw her header superbly tipped over the bar. Yet the Greens were then stunned when, nine minutes before time, a defensive error let Raquel Murray in for Basildon. Almost immediately the visitors scored their second when goalkeeper Lindsay Rogers dallied on the ball and Patricia Gimenez nipped in to dispossess her and score. 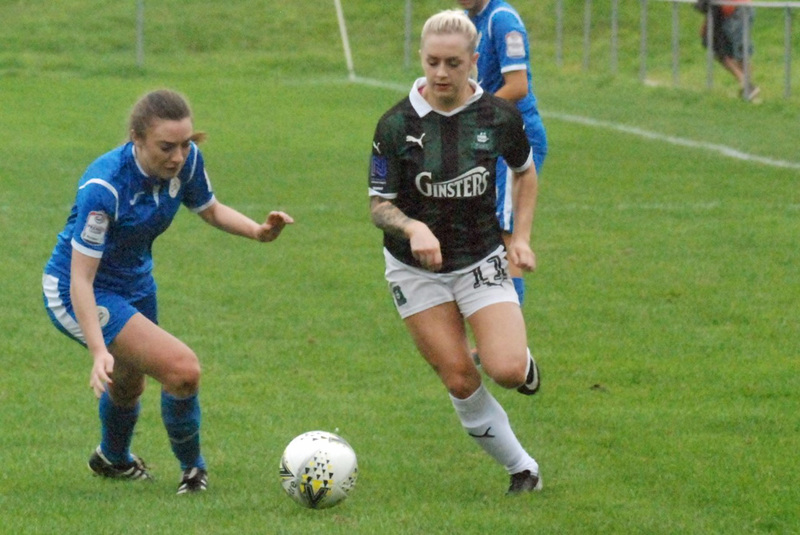 Argyle responded immediately with Middleton slamming in a penalty after Zoe Cunningham had been fouled in the box. But the last word went to Basildon when a mix-up in the Pilgrims defence ended with a simple tap-in for Gimenez. Argyle development team also won 5-3 on Sunday. They beat St Agnes at home in the South West League Western Division. 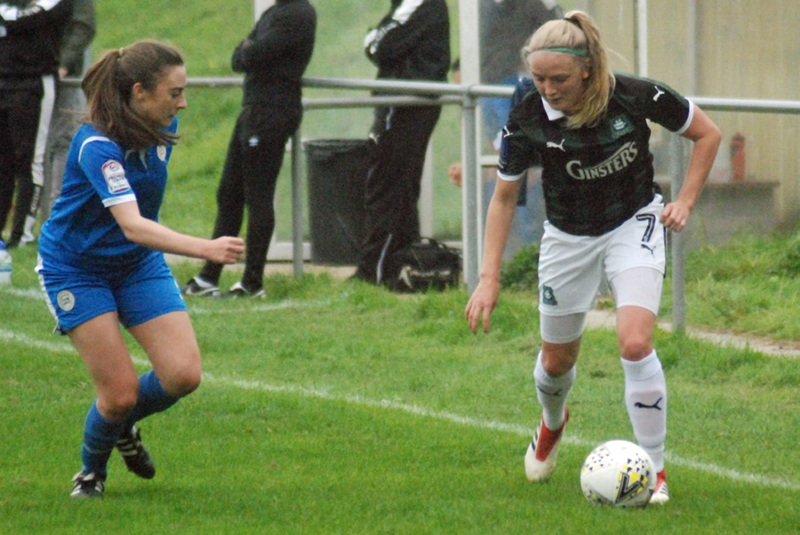 Argyle’s youngsters got off to a terrible start when in the first minute débutante Kayleigh Brown suffered a knee injury which saw her have to go off. And within 90 seconds they were a goal down through Debbie Duncan. They then lost defender Becky Parkyn to an ankle injury. But they slowly got themselves back into the game and a decent passing move which started with Amy Darnley in the Argyle goal was finished by Nicola Champio, who shot from outside the penalty area to equalise. Gabi Alphous then struck a post before she did give Argyle the lead 10 minutes into the second half when she lobbed in after receiving a good ball from Kelly Vinnicombe. Vinnicombe then made it 3-1 when she latched on to a loose ball inside the penalty area to fire home. The ever-dangerous Lucy Solloway increased the Pilgrims’ lead with a clinical finish. St Agnes then stunned the home side when Duncan and Jodie Hood made it 4-3. In a nail-biting finish, St Agnes got caught on the counter-attack and the pacey Alphous seal the win when she tucked away a rebound after her first effort had been saved.